Last year I wrote a long piece about the director George Sherman. Today I will return to him and look closer at two of his best films. There are two things in particular that stand out in Sherman's body of work, the progressive politics and the visuals (sometimes in combination with exceptionally fine use of sound) but the focus this time will be almost exclusively on the themes of these two films. There will be an additional post next week. The 70 minutes of Reprisal! (1956) is one of the angriest attacks on racism that American cinema has to offer, and of all of Sherman's bitter and polemical films this might be the clearest and most direct. It is so streamlined and focused that it becomes almost an abstraction, turning over all possible angles of racial hatred and pointing out is contradictions, its relentlessness, its stupidity and its costs, and it leaves nobody untouched. In one scene a white man is pointing a gun at an American Indian* lying on the ground after having been knocked of his horse. The man with the gun shouts "Get up!" but the Indian answers "What different does it make if I'm in the dust or standing up? I'm an Indian!" in a voice signalling the oppression and terror, the dehumanisation, his people have suffered through several generations. The film begins with a slow pan over an inhospitable landscape until it reaches a barren tree, where the camera stops. There are two bodies on the ground and there are two ropes hanging from the tree. Then the title Reprisal! appears in red letters over the tree. There has been a lynching of two Indians, and three brothers are the accused. At a trial, held in a saloon, the crowd is firmly on the side of the accused, and their lawyer's argument is basically that the men are innocent, and the testimony of an Indian is not worth anything, in fact the very fact that an Indian was allowed to testify is a sin, and in any event killing Indians is not a crime. The jury takes ten seconds to come up with the verdict, pronouncing the men innocent (although they are clearly not). While the trial has been going on a stranger, Madden, has come to town, surprised by the empty streets, so he wanders into the saloon too, and witnesses the ordeal. He has come to take possession of some land that he has bought, and he befriends the local magistrate and his pretty daughter. The daughter is also a defender of the Indians, an outspoken liberal. Madden though does not want to get involved, he just wants to get his land and start to build a future for himself. But that is not to be. He is clearly torn, filled with bottled-up rage and clearly sympathetic to the Indians. 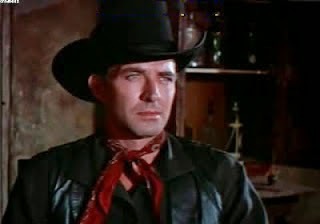 He is a stand-up guy, handsome and brave, a conventional hero of Westerns. After 40 minutes it is revealed that his mother was Indian and she raised him by herself, he is of mixed race, but he only wants to acknowledge one half, the white half, because that is the only way he will be able to live free and have his own land to work on. Or so he believes, but with the town so consumed by racism, with drunken men riding into "Indiantown" with guns blazing and scaring away the Indians' horses, he eventually has to accept that he cannot live in hiding. Especially not when his maternal grandfather finds him, and wants to stay with him. "You are my only remaining kin." he says with sad eyes, the old man only wanting to be near his grandson, even if it means pretending to be his servant, so nobody will suspect that something strange is going on. But the grandfather also asks difficult questions. "Who are your people? Where do you belong? Where?" Finally the man renounces his white half, acknowledges his grandfather, after his death, and rides away, now an Indian. No longer Madden but Neola. All he wants is to be treated just like a man, not a white or an Indian, but just a man. This the world will not allow. At least not yet. You could read the film as it is, about racism in the old west, but you might as easily read it as an allegory about racism in 1950s America, with African Americans in the place of the American Indians. Of course, by the standards of today Reprisal! might be seen as having flaws in its representation of the Indians, but that does not take away its honest intentions and palpable anger and disgust. The Last of the Fast Guns (1958) has a different tone, it is not angry or political in the same way, but it has the same sadness and bitterness that is to be found in most of Sherman's best films. This is a film which is primarily set outdoors, where Sherman is most at home, in some mountains in Mexico, and it opens when the main character Brad Ellison, all dressed in black, arrives in a small town to kill a man. They meet at the square and there is a cut to some graves outside town, which Brad passed on his way, and then some shots are heard. We never see the gunfight; we can just assume that it took place and that those graves will not be wanting for bodies. Then Brad is called in to see an old man, crippled and in a wheelchair. The old man gives Brad an assignment, to find the man's missing brother, who might be somewhere in Mexico. Brad, tired and weary and aware that he will not live for very long (27 is old for a person such as him), accepts the assignment and the money and rides down south to see what he can find. On the way he stops at an old ruin in which some men are hiding out. They know each other and when Brad arrives they ask about some friends they have in common. Brad tell them their friends are all dead, gunned down, some have been shot in the back by their friends, such as Jesse James. Even Billy the Kid is dead, killed by Pat Garrett. The men look aghast. "We just found out the sun is setting." one of them says, visibly shaken. It is an exceptional scene, and illustrative of the terseness of the film, where few words are spoken and the words that are spoken are often clipped and hard. When Brad has come deep into Mexico he makes some friends, he meets a woman and a wise old priest, yet he continues his pursuit of the missing man, the ghost he is chasing. People speak of him, but they all say that he has died. Nobody has seen him die, but they all seem to know that he has. But where is the grave? "Up in the hills." Brad also meets another man on horseback, Miles Lang, all dressed in white, and they become friends, riding together. They are basically the same person, the white half and the black half, where the black is the future and the white is the past, the man he once was and no longer wants to be, and whom he may have to kill in order to become free. The priest, a poor, humble man, tries to talk some sense into Brad. "There is treasure to be found in the hills, but it is not gold. It is peace of mind." Because that is what the priest has found. He was living a stressful life like a business man, but now he has peace. It was either that or death, and Brad knows that he too has that choice. Peace of mind in the hills or inevitable death. Yet the choice is surprisingly hard. The Last of the Fast Guns is a wonderful film, a great film even, unusual in many respects, and with a special kind of poetry. As always with Sherman the visuals are very impressive and the mountains in which the second half of the film is set are put to vivid use. The film was shot in various parts of Mexico, such as Cuernavaca, Tepoztlan, Taxco and the Estudios Churubusco, and the cinematographer was from Mexico, Álex Phillips Jr. The film might be Sherman's greatest achievement. 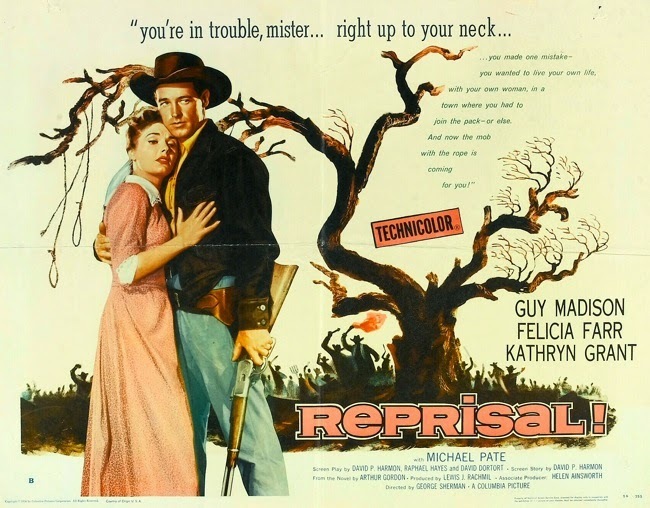 Reprisal! and The Last of the Fast Guns have not only Sherman in common, they are also both written by David P. Harmon, alone on The Last of the Fast Guns and together with Raphael Hayes and David Dortort on Reprisal!. All of these writers would otherwise write almost exclusively for TV, and at least Reprisal! feels like a TV movie at times, stylistically. The Last of the Fast Guns however does not, and the Sherman touch is stronger on it. But they are both essential. *There is no consensus on which term to use. Some prefer to be called Native Americans (or First Nations), some prefer to be called American Indians, and some prefer to be called by their own nations, such as Sioux or Cheyenne. Another suggested term is Indigenous, which seems to be the least popular. A related post is one I wrote last year about racism in American cinema. Two earlier posts about Sherman here and here. David Dortort was also one of the writers on The Lusty Men (Nicholas Ray 1952), a film which is rather different from Reprisal! and perhaps Ray's greatest film. Álex Phillips Jr. was cinematographer for over 100 films in Mexico, and sometimes in the US, and one of them was Sam Peckinpah's Bring Me the Head of Alfredo Garcia (1974). The last film of Manoel de Oliveira that I saw in a cinema was Eccentricities of a Blonde-Haired Girl (2009), and when he made it he was 100 years old. Not that it showed in the film, which was as spruce and good as any made that year. (It opens with a scene in a train car, one long take with a stable camera, and the only thing that happens is that the conductor walks through the train asking everybody for their tickets.) After that he made two more feature films and several short films, until he finally gave up a couple of weeks ago, and died, 106 years old. He was Portuguese, born in Porto, and began making films in the late 1920s, shorts and documentaries, and his first feature was made in 1942, Aniki Bóbó. Then came a gap of 14 years until he could make another film (partly because of the dictatorship of Salazar) and he made another feature in 1963, Acto da Primevera. But it was not until after the end of the dictatorship in 1974 that he was free to completely unleash his creativity. I have not seen all that much of his features, maybe six or so, but most of them have been powerful, and often delightful as well. 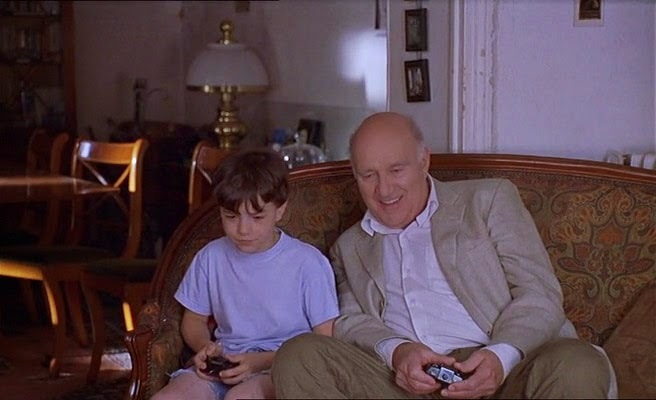 I am particularly fond of I'm Going Home (2001). It is about death and art, but done with such a light touch and wry humour making the film a pure joy. At least until the last 15 minutes or so which are agonizing. The main character, Gilbert Valence, is a famous older actor, played by Michel Piccoli, who loses his wife, son and granddaughter in a car accident and is left alone with his young grandson. 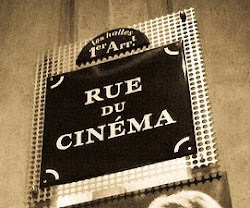 Yet the film consists mostly of Gilbert's daily activities, such as buying new shoes, having a cup of coffee, meeting his agent, being mugged by a punk, and observing his home town, which is Paris. It is all done with exceptional warmth, restraint and wit. Here Gilbert and his grandson bond by driving R/C cars together. I love this film, and it is available on DVD with English subtitles. Among de Oliveira's earlier documentaries I have seen only one, The Artist and the City (1956), about a painter in Porto. It is something of a city symphony (which were otherwise popular in the 1920s), and worth a look. In the beginning of A Time to Love and a Time to Die (Douglas Sirk 1958) there is a scene where a group of German soldiers at the eastern front see a frozen hand in the snow-covered ground. It is not just the hand, it is clearly attached to a body hidden in the snow. So they dig it out and it turns out it is a comrade of theirs, who had been missing for some time. As the body is removed from its ice package it starts to melt, including the frozen eyeballs, making it look like the dead man is crying. It is based on a novel by Erich Maria Remarque called Zeit zu leben und Zeit zu sterben which means A Time to Live and a Time to Die. When the book was translated into English the title got the word Love instead of Live, and became more poetic for it. Remarque also plays a part in the film, as a professor hiding from the Gestapo. It is one of several adaptations of his writing, earlier successful efforts include All Quiet on the Western Front (Lewis Milestone 1930) and Three Comrades (Frank Borzage 1938), but they are not like this film. At one point a woman is summoned to Gestapo headquarters and as she is not home her husband goes instead. When he gets there he is given a small wooden box and a document to sign. He looks at it with confused eyes and asks "What is this?" The Gestapo clerk says, emotionless, "That is a receipt for the ashes of your wife's father." This is the first they have heard about him for a very long time but for the Gestapo it is just an annoying routine, paper work that must be dealt with. They killed him, now the remains must be handled according to the manual, the signatures collected, the papers rubber stamped and properly filed. In another scene the young soldier on leave meets an old school-friend by chance, a man who is now an important member of the Nazi party. ("Imagine that. Me, the milkman's son.") He invites the soldier to his home, and asks if he wants to take a bath. The soldier says yes, and after he has taken of his clothes and sat down in the bathtub the other man joins him. Not in the water but he sits on the side of the tub, and they drink wine together, whilst the Party man talks flippantly about concentrations camps. Later there is a party scene in the same house, filled with drunkenness, seductions and self-loathing, close to surreal, that Luchino Visconti might have approved of. An uncomfortable message is that there is no escaping the guilt for what has happened, is happening. "We're only following orders." is not a valid excuse. The only one free of guilt is a Jew hiding in the ruins. The scene above is set in a museum, destroyed by bombs, in which the young lovers have taken shelter, a poignant symbol of what has been lost, the art and history of Germany a victim, but still there under the wreckage to be brought back for a new generation. As it happened I read W.G. Sebald's novel Austerlitz (one of the greatest of books) shortly after I had re-watched A Time to Love and a Time to Die and it struck me that the two work well together, as stories about the trauma in the heart of Europe in the middle of the twentieth century. There are other unforgettable images all through the film, such as a black horse-driven hearse abandoned on a street during a bombing raid, or a rocking horse on fire outside a home, or children's drawings on a wall of bombs falling. As always with Sirk every scene, every shot, every image is a symbol of something larger. By the river in the town a tree is in blossom, although it is too early in the year, not warm enough. But a bomb has started a fire and the heat from the fire, while damaging half of the tree, has made the other half blossom. Life and death, beauty and ugliness, in the same tree, side by side. It is there too in Lilo Pulver's wonderful performance of Elisabeth, the young girl, combining pride, fear and an urge for happiness, always under a deep cloud of sadness. The young soldier, played by John Gavin, is more consumed by doubt and guilt. But the sadness covers him too. The two young lovers do not have much time, he will soon go back to the Russian front and death is inevitable. So they must date, fall in love, sleep together and get married in just a few days. There is no time for anything but honesty and openness. At the same time they are worried about their families; whether they are alive and, if they are alive, where they are. This is not really a time for love, but love we must because why else go on living? Between 1955 and 1959, Sirk made All That Heaven Allows (1955), There's Always Tomorrow (1956), Written on the Wind (1956), The Tarnished Angels (1957), A Time to Love and a Time to Die and Imitation of Life (1959), a streak of extraordinary films. He had made fine films before, such as Lured (1947), Has Anybody Seen My Gal (1952) and All I Desire (1953), but it was in those final years he was at his best. Most of them were shot by cinematographer Russell Metty, produced by Ross Hunter (two by Alfred Zugsmith), and with music by Frank Skinner. However, on A Time to Love and a Time to Die, the only member of Sirk's regular crew who participated was Metty. Miklós Rozsa wrote the music and Robert Arthur was producer. Sirk made two other films between 1955 and 1959, Interlude (1957) and Battle Hymn (1957), but those I have not seen, and they seem to be regarded as minor work, by critics and by Sirk. I will eventually find out for myself. 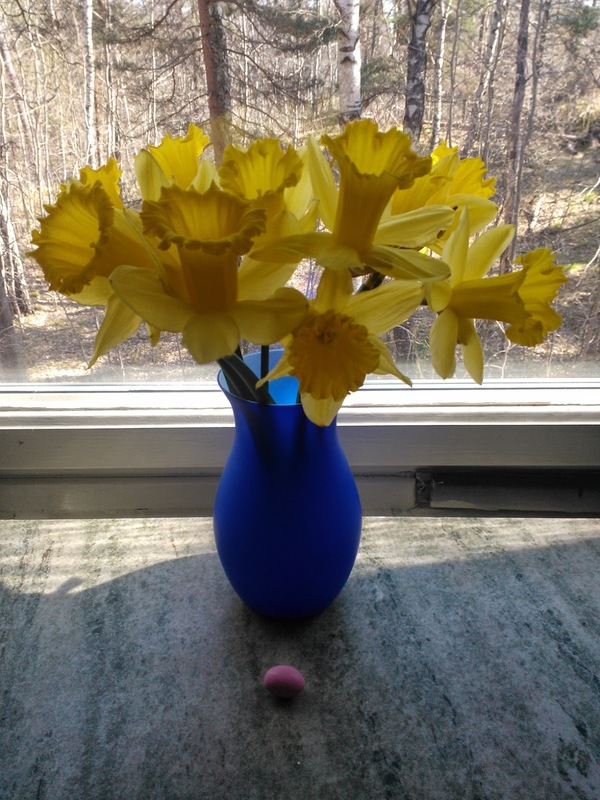 I am taking an Easter break so today there will be only a bouquet of Easter-flavoured flowers, and a scene from a film by Henry King which I did not mentioned in my previous post: Prince of Foxes (1949). It is a fine film, but this scene, with Orson Welles, is exceptional, like a short film in its own right. Welles, as so often, combines malice, wit and exuberance, and the set is astonishing, just look at those walls. Notice too how Welles's hands are consistently very busy.